The importance of having a good, positive culture in the workplace cannot be underestimated. The Boston Red Sox won 108 games during the regular season this year, the most in franchise history, and then cruised through the postseason to win their fourth World Series title since 2004. The Sox had to compete against plenty of other talented baseball teams in 2018, but perhaps none had the camaraderie and culture the Boston team had in their clubhouse. Maybe none had such a supportive, selfless manager like Alex Cora at the helm, either. Talent and skills aren’t always the determining factors in winning. 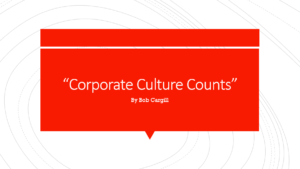 Without the right culture instilled into the workplace, even the best teams – and businesses in general – can fall behind the competition. Without a strong leader installed at the top, even the best teams can fall apart. Businesses and brands, companies and organizations of all sizes, shapes and forms…ask yourselves if you have the culture and leadership in place to win in the marketplace like the Red Sox won on the field this year.